Television is an amazing window on the world. At the flick of a button, you can travel from the North Pole to the Serengeti, watch men walking on the Moon, see athletes breaking records, or listen to world leaders making historic speeches. Television has transformed entertainment and education; in the United States, it's been estimated that children spend more time watching TV (on average 1023 hours a year) than they do sitting in school (900 hours a year). Many people feel this is a bad thing. One of TV's inventors, Philo T Farnsworth (1906–1971), came to the conclusion that television was hopelessly dumbed down and refused to let his children watch it. Whether TV is good or bad, there's no doubting that it's an ingenious invention. But how exactly does it work? Let's take a closer look! Photo: Virtually everyone has flatscreen TVs these days, which make their pictures using LCDs, plasma, or OLEDs (organic LEDs). But until the 1990s, TVs were much bigger and bulkier and virtually all of them were using cathode-ray tube (CRT) technology, as explained below. The basic idea of television is "radio with pictures." In other words, where radio transmits a sound signal (the information being broadcast) through the air, television sends a picture signal as well. You probably know that these signals are carried by radio waves, invisible patterns of electricity and magnetism that race through the air at the speed of light (300,000 km or 186,000 miles per second). Think of the radio waves carrying information like the waves on the sea carrying surfers: the waves themselves aren't the information: the information surfs on top of the waves. Television is really a three-part invention: the TV camera that turns a picture and sound into a signal; the TV transmitter that sends the signal through the air; and the TV receiver (the TV set in your home) that captures the signal and turns it back into picture and sound. TV creates moving pictures by repeatedly capturing still pictures and presenting these frames to your eyes so quickly that they seem to be moving. Think of TV as an electronic flick-book. The images are flickering on the screen so fast that they fuse together in your brain to make a moving picture (really, though they're really lots of still pictures displayed one after another). When TV was first developed, all it could handle was black-and-white pictures; engineers struggled to figure out how to cope with color as well, which was a much more complex problem. Now the science of light tells us that any color can be made by combining a mixture of the three primary colors, red, green, and blue. So the secret of making color TV was to develop cameras that could capture separate red, green, and blue signals, transmission systems that could beam color signals through the air, and TV sets that could turn them back into a moving, multicolored image. We can see things because they reflect light into our eyes. An ordinary "still" camera photographs things by capturing this light on light-sensitive film or using electronic light-detector (in the case of a digital camera) to make a snapshot of how something appeared at a particular moment. A TV camera works in a different way: it has to capture a new snapshot over 24 times per second to create the illusion of a moving picture. Photo: A typical video/TV camera. The camera operator stands at the back watching a small TV screen that shows exactly what the camera is filming. Note that the cameraman isn't looking through the camera lens: he's seeing a recreation of what the lens is viewing on a screen (a bit like looking at the display on a digital camera). Photo by Justin R. Blake courtesy of US Navy. What's the best way for a TV camera to capture a picture? If you've ever tried copying a masterpiece from the wall of an art gallery into a notebook, you'll know there are lots of ways to do it. One way is to draw a grid of squares in your notebook, then copy the details systematically from each area of the original picture into the corresponding square of the grid. You could work from left to right and from top to bottom, copying each grid square in turn. An old-fashioned TV camera works exactly like this when it turns a picture into a signal for broadcasting, only it copies the picture it sees a line at a time. Light-detectors inside the camera scan across the picture line by line, just like your eyes scanning from top to bottom of the picture in an art gallery. This process, which is called raster scanning, turns the picture into 525 different "lines of colored light" (in a common TV system called NTSC, or 625 lines in a rival system known as PAL) that are beamed through the air to your home as a video (picture) signal. At the same time, microphones in the TV studio capture the sound that goes with the picture. This is transmitted alongside the picture information as a separate audio (sound) signal. Modern TV cameras don't "scan" pictures this way anymore. Instead, just as in camcorders and webcams, their lenses focus the scene being filmed onto small, image-sensing microchips (either CCD or CMOS sensors), which convert the pattern of colors into digital, electrical signals. While traditional scanning cameras used only 525 or 625 lines, the image sensing chips in today's HDTV (high-definition television) cameras generally have either 720 or 1080 lines for capturing much more detail. Some cameras have a single image sensor capturing all colors at once; others have three separate ones, capturing separate red, blue, and green signals—the primary colors from which any color on your TV can be made. Artwork: TV cameras break pictures up into separate red, green, and blue signals. White light (made of all colors) coming from the object being filmed passes through the lens (1) and enters a beam splitter (2). This is usually a two-part, trichroic prism that divides the light into separate red, green, and blue beams, each of which is detected by a separate CCD or CMOS image sensor. 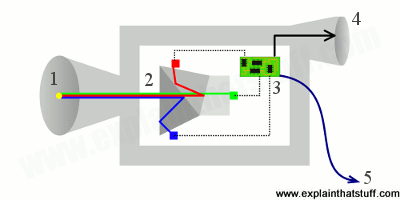 A circuit (3) mathematically synchronizes and combines the outputs from the red, green, and blue image sensors to make a single video signal based on components called luminance and chrominance (loosely, the brightness and color of each part of the image). Another part of the circuit instantly recreates the image being filmed on a small screen in a viewfinder (4). Meanwhile, sound from a microphone (not shown) is synchronized with the video signal to produce an output signal ready for transmission (5). The louder you shout, the easier it is to hear someone at a distance. Louder noises make bigger sound waves that have the power to travel further before they get soaked up by bushes, trees, and all the clutter around us. The same is true of radio waves. To make radio waves that are strong enough to carry radio and TV pictures many miles from a TV station to someone's home, you need a really powerful transmitter. This is effectively a giant antenna (aerial), often positioned on top of a hill so it can send signals as far as possible. Not everyone receives TV signals transmitted through the air in this way. If you have cable television, your TV pictures are "piped" into your home down a fiber-optic cable laid beneath your street. If you have satellite television, the picture you see has been bounced into space and back to help it travel from one side of the country to the other. With traditional television broadcasting, picture signals are sent in analog form: each signal travels as an undulating (up-and-down moving) wave. Most countries are now switching over to digital television, which works in a similar way to digital radio. Signals are transmitted in a numerically coded form. Many more programs can be sent this way and, generally speaking, picture quality is better because the signals are less susceptible to interference as they travel. It doesn't really matter how the TV signal gets to your home: once it's arrived, your TV set treats it exactly the same way, whether it comes in from an antenna (aerial) on the roof, from a cable running underground, or from a satellite dish in the garden. Remember how a TV camera turns the picture it's looking at into a series of lines that form the outgoing TV signal? A TV set must work the same process in reverse to turn the lines in the incoming signal back into a faithful image of the scene that the camera filmed. Different types of TV sets do this in different ways. 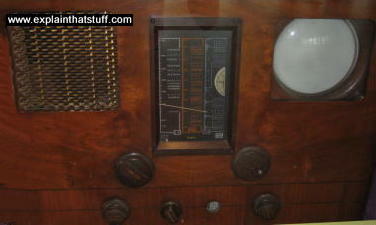 Photos: Early TV receivers. 1) A typical black and white TV from 1949. Note the tiny screen. 2) An HMV 904 combined TV and radio unit from about ten years earlier. The loudspeaker is on the left, the radio tuning dial is in the center, and the TV screen (again tiny) is on the right. Both use cathode-ray tube technology and are exhibits from Think Tank, the science museum in Birmingham, England. 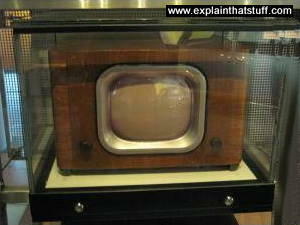 Photo: A typical old-fashioned cathode-ray-tube (CRT) television set. Virtually every TV looked like this until the 1990s, when flatscreen LCD and plasma TVs began to take over. Cathode-ray TVs are getting quite hard to find now! 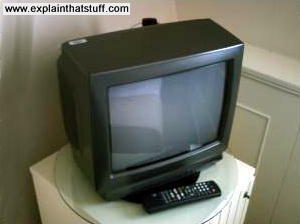 Old-style, cathode-ray tube (CRT) TV sets take the incoming signal and break it into its separate audio and video components. The audio part feeds into an audio circuit, which uses a loudspeaker to recreate the original sound recorded in the TV studio. Meanwhile, the video signal is sent to a separate circuit. This fires a beam of electrons (fast-moving, negatively charged particles inside atoms) down a long cathode-ray tube. As the beam flies down the tube, electromagnets steer it from side to side so it scans systematically back and forth across the screen, line by line, "painting" the picture over and over again like a kind of invisible electronic paintbrush. The electron beam moves so quickly that you don't see it building up the picture. It doesn't actually "paint" anything: it makes bright spots of colored light as it hits different parts of the screen. That's because the screen is coated with many tiny dots of chemicals called phosphors. As the electron beam hits the phosphor dots, they make a tiny pinpoint of red, blue, or green light. By switching the electron beam on and off as it scans past the red, blue, and green dots, the video circuit can build up an entire picture by lighting up some spots and leaving others dark. An antenna (aerial) on your roof picks up radio waves from the transmitter. With satellite TV, the signals come from a satellite dish mounted on your wall or roof. With cable TV, the signal comes to you via an underground fiber-optic cable. The incoming signal feeds into the antenna socket on the back of the TV. The incoming signal is carrying picture and sound for more than one station (program). An electronic circuit inside the TV selects only the station you want to watch and splits the signal for this station into separate audio (sound) and video (picture) information, passing each to a separate circuit for further processing. The electron gun circuit splits the video part of the signal into separate red, blue, and green signals to drive the three electron guns. The circuit fires three electron guns (one red, one blue, and one green) down a cathode-ray tube, like a fat glass bottle from which the air has been removed. The electron beams pass through a ring of electromagnets. Electrons can be steered by magnets because they have a negative electrical charge. The electromagnets steer the electron beams so they sweep back and forth across the screen, line by line. The electron beams pass through a grid of holes called a mask, which directs them so they hit exact places on the TV screen. Where the beams hit the phosphors (colored chemicals) on the screen, they make red, blue, or green dots. Elsewhere, the screen remains dark. The pattern of red, blue, and green dots builds up a colored picture very quickly. Meanwhile, audio (sound) information from the incoming signal passes to a separate audio circuit. The audio circuit drives the loudspeaker (or loudspeakers, since there are at least two in a stereo TV) so they recreate the sound exactly in time with the moving picture. 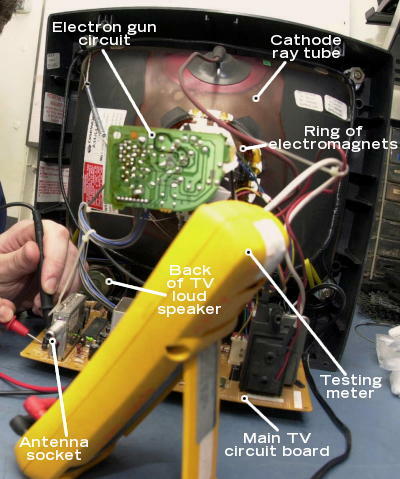 Photo: An old-style cathode-ray tube television being tested and repaired. The yellow box at the front is a meter that tests the current flowing through the TV's circuits. The opened-up TV is behind and we're looking from the back to the front (so the screen is pointing away from us). Photo by Airman Maebel Tinoko courtesy of US Navy. Cathode-ray televisions like this were invented by Russian physicist and electronics engineer Vladimir Zworykin, whose patent on the idea was filed in 1923 and granted five years later. Here's a detail from one of the original drawings in that patent—and you can see just how closely it resembles a "modern" CRT. Artwork: Zworykin's black and white CRT design from the 1920s. Inside the cathode ray tube (55, gray), there's a single electron gun, made up of an anode (56, dark blue), cathode (57, light blue), and a grid (54, yellow) in between. In the middle, there are electric plates (58, 59, red) and coils (69, 70, orange) for steering the electron beam with electromagnetic fields. The picture is formed on a fluorescent phosphor screen (60) at the end of the tube. 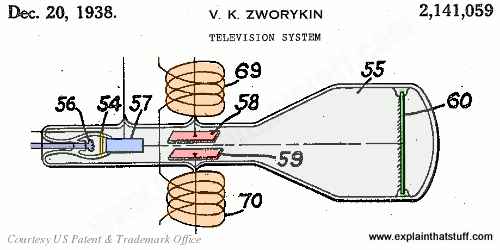 From US Patent: 2,141,059: Television System by Vladimir Zworykin, courtesy of US Patent and Trademark Office. It's quite hard to find cathode-ray tube televisions today. Since they're based on analog technology and most countries are now switching to digital, CRTs are essentially obsolete (unless you use an adapter, called a set-top box, that allows your CRT to pick up digital broadcasts). Most people have flatscreens instead, using one of three different technologies: LCD, plasma, or OLED. LCD (liquid-crystal display) televisions have millions of tiny picture elements called pixels that can be switched on or off electronically to make a picture. Each pixel is made up of three smaller red, green, and blue sub-pixels. These can be individually turned on and off by liquid crystals—effectively microscopic light switches that turn the sub-pixels on or off by twisting or untwisting. Since there is no cumbersome cathode-ray tube and phosphor screen, LCDs screens are much more compact and energy efficient than older TV receivers. Read more in our article about LCDs. 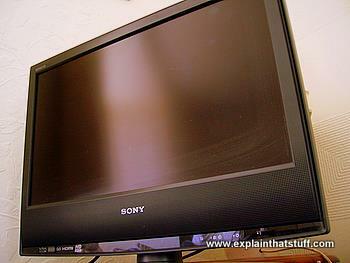 A plasma screen is similar to an LCD, but each pixel is effectively a microscopic fluorescent lamp glowing with plasma. A plasma is a very hot form of gas in which the atoms have blown apart to make negatively charged electrons and positively charged ions (atoms minus their electrons). These move about freely, producing a fuzzy glow of light whenever they collide. Plasma screens can be made much bigger than ordinary cathode-ray tube televisions, but they are also much more expensive. Read more in our article about plasma TVs. If you want a really flat TV, you'll probably opt for one that uses OLED (organic LED) technology. As the name suggests, OLEDs work a bit like normal LEDs, but they're made from organic (carbon-based) plastics instead of conventional semiconductors. An OLED display is very thin (just a few millimeters thick), very bright, and uses much less power than an equivalent LCD. Read more in our article about OLEDs. 1884: German student Paul Nipkow (1860–1940) invents a rotating disc with holes in it (later known as a Nipkow disc) that can convert an image into a series of light pulses. 1888: German physicist Heinrich Hertz (1857–1894) demonstrates how to make radio waves. 1894: Sir Oliver Lodge (1851–1940), a British physicist, successfully transmits a message by radio from one room of a building to another. 1922: American electronics engineer Philo T. Farnsworth (1906–1971) gets the idea for a TV scanning system as he watches his father's horse plowing a field into neat rows. 1923: Russian physicist and electronics engineer Vladimir Zworykin (1888–1982) files US Patent: 2,141,059 (granted in 1929) for a TV system that uses cathode-ray tubes in both the transmitter and receiver. 1924: Scottish inventor John Logie Baird (1888–1946) uses a Nipkow disc to transmit a flickering TV image a few feet across a room. 1925: Baird makes the first public demonstration of crudely scanned television images at London's Selfridges department store, with a more sophisticated demonstration to an invited scientific audience on January 26, 1926. 1927: Farnsworth files US Patent: 1,773,980 (granted 1930) for his image dissector, the world's first proper TV camera. 1928: Baird demonstrates color TV and an early form of 3D TV. 1932: BBC (British Broadcasting Corporation) begins public TV service on August 22, 1932. 1946: LP-record pioneer Peter Goldmark, of CBS, develops a color TV system that uses a rotating wheel to alternate red, blue, and green pictures. 1954: RCA (Radio Corporation of America) sells the first color TVs on March 25, 1954. 1964: Donald Bitzer, Gene Slottow, and Robert Willson, of the University of Illinois at Urbana-Champaign, produce the first plasma TV, based on a high-resolution computer display for a teaching system called PLATO. 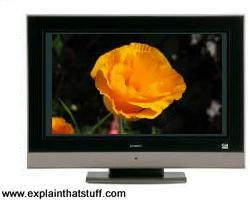 1988: The Japanese Sharp Corporation releases the first commercial LCD television. 1990s: The first public HDTV (high-definition TV) broadcasts are made in the United States and Europe. 1999: Time magazine names Philo T. Farnsworth one of the 100 most influential people of the 20th century. 2000s: Many countries switch from analog to digital TV. In the United States, for example, the changeover was completed in 2006, but some nations will not switch fully until well into the 2020s. 2007: Sony, another Japanese manufacturer, introduces the world's first OLED TV, the XEL-1, mainly as a "proof of concept." Even though the screen is a mere 28cm (11in), it sells for a whopping $2500. Television receivers: Photos and short descriptions of historic TVs from the UK's National Media Museum, Bradford. TV history: 75 years in the making: BBC News, February 6, 2001: Celebrating the 75th anniversary of the first Baird transmission. His vision made television by Elliott Arnold, Popular Science, November 1940. A great historic article about Philo Farnsworth's invention of electronic TV. Statistics on television and health: How many hours a week do people watch TV? These and other statistics compiled by Prof. Norman Herr, California State University. Television: A Biography by David Thomson. Thames and Hudson, 2016. A meaty biography of one of TV's pioneers. John Logie Baird: A Life by Antony Kamm and Malcolm Baird. National Museum of Scotland, 2002. A meaty biography of one of TV's pioneers. Television and Me by John Logie Baird and Malcolm Baird. Mercat Press, 2004. Baird's story in his own words. The Last Lone Inventor: A Tale of Genius, Deceit, and the Birth of Television by Evan Schwartz. HarperCollins Perennial, 2003. Biography of Philo Farnsworth. Philo T. Farnsworth: The Father of Television by Donald G. Godfrey. University of Utah Press, 2001. An alternative, scholarly biography. Zworykin: Pioneer of Television by Albert Abramson. University of Illinois Press, 1995. Biography of another key player in TV history. The History of Television: 1880–1941 and	The History of Television: 1942–2000 by Albert Abramson. McFarland, 2007/2009. One of the most comprehensive accounts of TV history by a former CBS camera, video, and sound man. Television Production Handbook by Herbert Zettl. Cengage, 2015. An easy-to-understand, up-to-date introduction for media students and industry professionals, with an emphasis on studio production. Newnes Guide to Television and Video Technology by K. F. Ibrahim. Newnes, 2007. Covers how television works in detail, including the basics of broadcasting and color TV principles, and the latest technologies such as digital and HDTV, LCD, plasma, and DLP. Television Technology Demystified: A Non-technical Guide by Aleksandar Louis Todorovic. Focal Press, 2006. A basic overview of TV technology geared to people who work in the TV industry, who don't necessarily want to understand everything in great technical detail. The Boy Who Invented TV: The Story of Philo Farnsworth by Kathleen Krull. Alfred A. Knopf, 2009. A 32-page book for grades 2–5. Behind the Scenes: Television by Sarah Medina. Wayland, 2013. Would you like to work in TV? This 32-page introduction explains how TV programs are researched, filmed, and broadcast, with an emphasis on jobs and careers. Ages 7–9. Vladimir Kosma Zworykin (1889–1982): An obituary from The New York Times, 1982. US Patent: 1,707,935: Television Apparatus by John Logie Baird, April 2, 1929. Baird's original rotating disc TV scanner. US Patent: 1,773,980 A: Television System by Philo T. Farnsworth, August 26, 1930. The original Farnsworth electronic TV patent. US Patent: 2,037,711: Method and Apparatus for Television by Philo T. Farnsworth, April 21, 1936. This later patent goes into more detail about image scanning and transmission. US Patent: 2,141,059: Television System by Vladimir Zworykin, December 20, 1938. 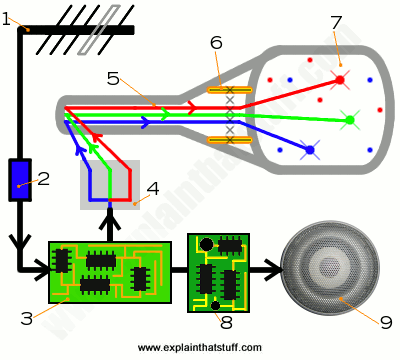 A detailed description of a typical 20th-century TV system using cathode-ray tubes for both the transmitter and receiver.